Introducing the Eco Sleep Hybrid Pocket Coil / Latex feel at an affordable price! Quality and comfort at an unbelievable price. Our Eco Sleep Hybrid model with bamboo and wool cover beats out other bed in a box mattresses for comfort and durability and is considered a very earth-friendly product. Comes with select-able firmness choices and if you make a mistake you can exchange the latex layer for a different firmness, just pay the shipping. You don't get that option with most bed in a box sellers. A quality spring will outlast inferior poly foam hands down and this one has 660 13.75 gauge individually wrapped coils in Queen size. Talalay process uses natural, biodegradable ingredients. Factory automation ensures optimized energy usage during the key molding stage of the Talalay process. Multistage mattress washer minimizes water usage. Our Talalay latex is Oeko-Tex 100 Class 1 certified to be free of any harmful chemicals and safe for babies. Instantly yet gently conforms to the contour of your body for exceptional orthopedic support and pressure relief. Proven to provide up to 33% more pressure relief and contouring support than memory foam. Helps maintain oxygen and nutrient flow to your muscles for a more recuperative sleep. At the heart of our all new design is new pocket coil system made by Leggett and Platt the leader in spring manufacturing. This model features a 6" firm pocket coil at the base. 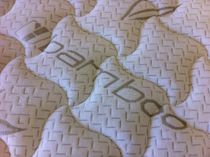 The latex mattress cover is a zippered cover made with bamboo and rayon fibers. Bamboo naturally resists bacteria, fungi, and dust mites while containing no harmful chemicals. Bamboo boosts four times the moisture absorbency of cotton for a drier, more comfortable sleep. Bamboo is also softer than cotton but stronger than synthetic fibers. Fabric is quilted to New Zealand Joma Wool. Hypoallergenic and antimicrobial to fight mold growth and odor causing bacteria. To enjoy the Eco Sleep difference, just order today. 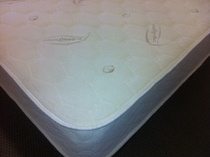 At Mattresses.net, we are pleased to deliver a wide variety of foam mattress topper and latex mattress selections. Just browse our online store for other designs and see for yourself why we are the greener, more affordable choice. It doesn't matter whether you want twin or king mattresses, we deliver a superior night's sleep for a fraction of the price of the competition. Our Eco Sleep is roll packed and ships via UPS. Please allow 2-3 weeks for delivery.